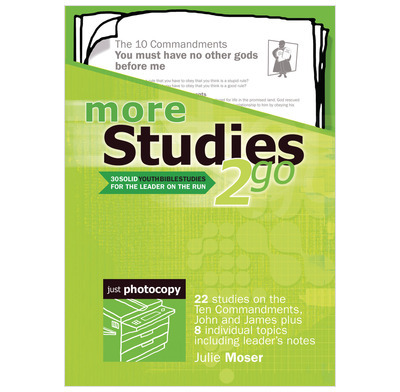 A second volume of studies to help youthworkers lead Bible studies that are both solid in content and enjoyable. The second book in the Studies to go series, designed for leaders on the run to lead a Bible study that is solid in content and enjoyable to do so. Contains 30 solid bible studies for youth. Includes leaders' notes. 60 - Guidance: How do I make the decisions that God wants me to make? 72 - Are you too busy? We have small group with limited time on Sunday mornings. This book has gone down really well and encourages discussion with positive learning. Just what I was looking for when linking teaching to today's living allowing them to discuss and consider as we go. Plus - I am not a teacher and the book is very usable for such people as me. Thank you. Reading through the intro notes, I realise that this book may not be suitable as the group I have is 3 0r 4 11 year olds of both sexes from Christian backgrounds. The amount of prep I would have to do would still be what I do now, so the term 'On the run' is a little misleading. However there are some ideas I could use. I used this with other material for an adult bible study group. It was well received. I found it very easy to use, and will deffinately use it on other occassions for all age groups. A good young teens teaching resource. Lessons are Bibllically solid with good, relevant application for this age group. I particularly like the fact the lessons aren't dated, allowing extra time on one theme if necessary or to miss a week for other services and not wasting valuable resources. The group enjoy the participation and discussion in each lesson. Building up a folder of each weeks material they have completed has been a benefit during discussion when we refer back to previous teaching. Looking forward to more in this series. Very good book, easy to use and follow. Good if you havent much time to prepare. It encourages discussion with the young people in the group. Would recommend to anyone working with teenagers. We have found this resource book to be excellent - It is straightforward to use and scripturally sound..wish there were more like it!